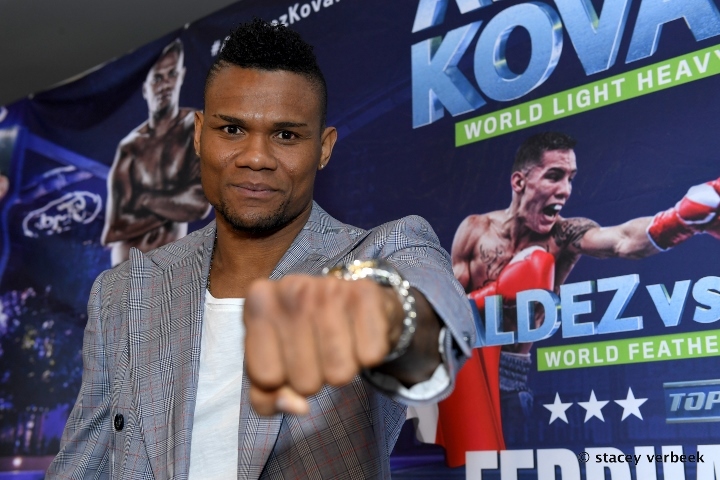 The Montreal Journal reports that former WBO light heavyweight champion Eleider Alvarez is back at the gym. After a weeks of rest, Alvarez is more motivated than ever to secure world championship bout by the end of the year. Alvarez has been clearing up his mind since he lost his title to Russia’s Sergey Kovalev. A reflection necessary to not repeat the same mistakes. He is ready for a fresh start, after losing a clear-cut decision to Kovalev in their rematch back in February. Alvarez had knocked Kovalev out in seven rounds back in August of last year. He made the mistake of going for a knockout victory from the very start of their bout. “I took advantage of my holidays in Colombia to spend time with my family and friends,” said Alvarez The Journal. “It made me feel good and I was able to change my mind. “I noticed that people in my country always support me despite my first career loss. I’m still very popular. I was at my cousin’s party. A woman went into the street and recognized me. She began to get so excited, as if she had just won a large sum of money. All she wanted was to take a picture with me! It was an amazing moment! Alvarez is slated to return to the ring on June 28 at the Videotron Center in Canada. One of the names being kicked around for him to face is Jessie Hart, who would move up in weight. Chisora: Joseph Parker Bitched Out, He Sh*t Himself!